The purpose of this study was to investigate the feasibility of simultaneous optimization and removal of dyes, Malachite green (MG), Rhodamine B (RhB) and Cresol Red (CR) from aqueous solutions by using Sistan sand as an extremely low cost adsorbent. Factors affecting adsorption of the analytes on the sorbent were investigated experimentally and by using Taguchi and Plackett–Burman experimental design methods. In most cases, the results of these two models were in agreement with each other and with experimental data obtained. Taguchi method was capable to predict results with accuracies better than 97.89%, 95.43%, and 97.79% for MG, RhB, and CR, respectively. Under the optimum conditions, the sorbent could remove simultaneously more than 83% of the dyes with the amount of adsorbed dyes of 0.132, 0.109, and 0.120 mg g−1 for MG, RhB and CR on sand, respectively. Kinetic studies showed that pseudo second order is the best model of adsorption for all analytes. Thermodynamic parameters revealed that this process is spontaneous and endothermic. Industrial wastewater is one of the major pollutants of the environment. Colored wastewaters are produced in many industries such as textile, pharmaceutical, food, cosmetic and leather industries [1, 2]. Annually, more than 10,000 metric tons of dyes are consumed in textile industries which makes their wastewater as one of the most important environmental pollutants . Typically, the main pollutant in textile wastewater is organic dyes which many of them are resistant to biodegradation. Moreover, colored wastewater prevents the penetration of sunlight into the water and reduces the speed of photosynthetic process [4–7]. More importantly, their carcinogenic effects and genetic mutations in living organisms are proved [8, 9]. Therefore, it is of importance to maintain human and environmental healthy by removing dyes using cheap and economical methods. Various methods have been evaluated for this purpose, such as electrochemical coagulation, using membranes, photocatalytic techniques, electrochemical methods, biological processes and adsorption techniques . Since adsorption process is the most economical method and has a simpler operational capability, in most cases, it is preferred to other techniques [10, 11]. Nano-particles are of high interest for simultaneous removal of dyes nowadays. For example, cobalt hydroxide nano-particles were applied for simultaneous removal of Indigo Carmine and Methyl orange . In another study, four toxic dyes including Brilliant Green, Auramine O, Methylene Blue and Eosin Yellow were removed by CuO Nano-particles loaded on activated carbon . While nano-particles show good performance and high capacity, synthesis of them needs high skill and pure materials are needed; so, most of these materials are not produced in large quantities. Consequently, they are not available in sufficient bulk to be commercialized for full-scale application. Because of these drawbacks, many researchers tried to find cost-effective adsorbents to eliminate dyes [14, 15]. Natural sands contain active components that can strongly adsorb positively charged organic material from an aqueous solution. The potential of using sand for this purpose has been studied and results were promising [16, 17]. However, we could not find any report on applying sand for simultaneous removal of dyes. For optimization of the parameters affecting adsorption efficiency, it is very common to use one-factor-at-a-time (OFAT) method, in which all parameters are keeping constant while one factor is optimized. In this method, it is assumed that each parameter is completely independent of the others. There are obvious advantages for design of experiment (DOE) methods over OFAT, including less resource requirements; ability to assess the effect of factors precisely; and finally by this method, interaction between factors is not neglected [18–20]. Taguchi method is one of these DOE methods which is mainly developed for optimization. By using Taguchi method, the impact of each controllable factor can be determined as well . Plackett–Burman Design (PBD) is a well-established and widely used statistical technique for selecting the most effective components affecting adsorption process with high significance levels for further optimization . 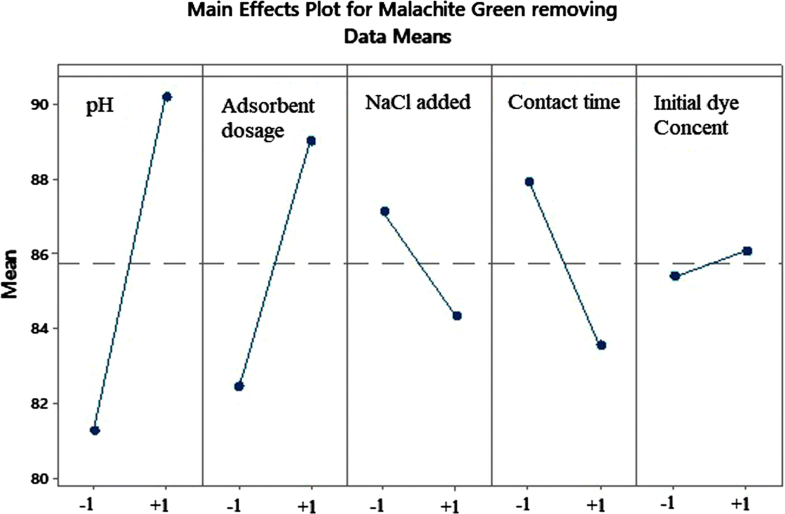 In this study, very cheap sand sorbent is used for simultaneous removal of three dyes, Malachite green, Rhodamine B and Cresol Red from water samples and in order to find the optimum conditions for this process, Taguchi design was used. This method selected because it has some advantages over other traditional uni-variant optimization techniques, including less number of experiments is required [23–25]. Moreover, Plackett–Burman design was also applied for the same purpose and results were compared to Taguchi design. ANOVA was used to determine and confirm the results obtained experimentally. Sand which was used in this study as dye sorbent was collected from Sistan desert, south east of Iran. MG (catalog number 1013980025), RhB (catalog number 1075990025) and CR (catalog number 1052250005) dyes were purchased from Merck KGaA, Darmstadt, Germany. Table 1 shows physical and chemical characteristics of these adsorbates. Other solvents and reagents were purchased from Fluka AG (Switzerland). Stock solutions of dyes were prepared by dissolving 0.5 g of each dye in distilled water in 1000 mL volumetric flasks. The test solution containing a mixture of MG, RhB and CR were prepared daily by diluting the proper volume of stock solution in deionized water. pH meter (model EasySeven, Metrohm, Switzerland) was applied to measure the pH of sample solutions. In order to determine the residual concentration of dyes after adsorption, UV–Vis spectrophotometer (model Lambda 25, Perkin Elmer Corp., USA) was used. Sistan sands were characterized by scanning electron microscope (SEM, model EM3900M, KYKY, China) and Fourier transform (FT-IR) spectroscopy (Spectrum two FTIR, Perkin Elmer Corp., USA). Minitab 16 and Qualitek 4 softwares (version 14.7.0) were used for PBD and Taguchi design methods, respectively. In order to study the efficiency of simultaneous removal of MG, RhB and CR by sand, batch technique was used for their adsorption; and to optimize parameters affecting adsorption, design experiments according to Taguchi design L16 was employed (Fig. 1). Experiments were performed in 6 steps: (1) 20 mL solution of 3-dyes mixture, with the concentrations mentioned in Additional file 1: Table S1, was prepared in a 50 mL flask. (2) pH of the sample solution was adjusted either by 0.1 M HCl or 0.1 M NaOH. (3) Appropriate amounts of NaCl and adsorbent were added to the flask carefully. (4) Sample was shaked on a shaker for a preset time to reach equilibrium state. (5) This mixture was centrifuged for 10 min at 5000 rpm (1957 relative centrifugal force) to separate adsorbent particles from the solution and supernatant liquid were collected. (6) The concentration of dyes remained in the sample after removal of the dyes, was determined spectrophotometerically against a blank in the wavelengths mentioned in Table 1. External calibration curves were used. where Ce and C0 are equilibrium and initial dyes concentration (mg L−1) respectively. where C0 and Ce (mg L−1) are respectively the concentration of dyes at initial point and at equilibrium, V (L) is the volume of the solution and m (g) is the mass of dry adsorbent used. where n is number of replications s, and yi is the response of detector. Since the process of simultaneous removal of MG, RhB and CR was desired, 5 factors in 4 levels were chosen and L16 was offered by Qualitek 4 (Table 2). Consequently, 16 experiments were designed. Additional file 1: Table S1 shows the factors and levels which were used in these set of experiments. After doing experiments, optimum levels for each factor were determined by S/N and mean of mean (Table 3). As can be seen in scanning electron microscope (SEM) image of Sistan sand (Fig. 2), it has an irregular and fractured surface structure. The average size of adsorbent particles was 250 µm which was determined using ImageJ software. The FT-IR spectrum of sand (Additional file 1: Figure S1) shows a main peak at 1004 cm−1 which refers to quartz. Presence of quartz is also proved by absorption bands at 1004, 776, 695, 531 and 462 cm−1. A peak at 2347 cm−1 can be assigned to silane . To obtain the best performance of the adsorption process for simultaneous removal of three target dyes and achieving satisfactory efficiency in the shortest possible time, several parameters influencing adsorption were studied and optimized while all target compounds were exist in the sample solution. The parameters studied were the amount of sorbent, pH of sample solution, effect of contact time, ionic strength of the sample solution, and initial concentration of each dye. Each experiment was run in triplicates. Initial pH of sample solution has a great effect on adsorption capacity. In order to find the effect of pH on simultaneous adsorption of MG, RhB and CR on Sistan sand, pH of solutions were varied between 6 and 9. Figure 3 represents the results of simultaneous dye removal based on mean and S/N versus pH. As can be seen, optimum pH is 8.0 in level 3. For CR and MG, the optimum pH is falling at basic pHs due to the formation of negative charges on the adsorbent surface; and at the same time, protonation of these two dyes . For RhB, the adsorption is high in acidic media and decreases with the increase in pH of the solution. It can be interpreted according to the pKa of RhB which is 3.7. Above this pH, deprotonation of the carboxyl functional group occurs and therefore, an attraction between the carboxylate ion and the xanthene groups of the RhB results in the formation of dimers of the dye which results decreasing in adsorption, however this decrement is not very sharp in the pH interval we studied . What is illustrated in Fig. 4 is the effect of adsorbent dosage on percent of simultaneous removal of MG, RhB and CR dyes. As can be seen, due to the increment of the available sorption sites, percent of dye removing increases with increasing of adsorbent dosage. In order to study this effect by Taguchi method, experiments were designed with 4 levels of adsorbent in the range of 0.5–2.5 g. The optimum level for this factor is second level . The salting-out effect is widely applied in traditional liquid–liquid extraction because it makes the solubility of organic targets in the aqueous phase decrease; thus, more analytes enter into extracting phase. In this study, the influence of salt on the adsorption process was studied at the presence of sodium chloride within the concentration range of 0.025 to 0.100 g mL−1. It was observed that changing the ionic strength has different effect on adsorption of different dyes (Additional file 1: Figure S2). By increasing the amount of NaCl, the efficiency of removal of CR increased, while for the two other dyes, the efficiency was decreased. Due to the competition between cationic dyes (MG, RhB) and Na+ ions toward the available adsorption sites, by increasing the ionic strength, the activity of the dyes and the active sites of the sand decreases; hence, the amount of adsorption decreases . On the other hand, for CR, any increase in the ionic strength of the solution leads to the repulsive electrostatic attraction, which leads to adsorption increase . Optimum level for this factor was selected in level 3. Removal of dyes by sand was carried out after 10, 20, 30 and 40 min of starting the adsorption process. Results are shown in Additional file 1: Figure S3. For RhB, when contact time increases, removal percent goes up and finally reaches to a constant level which deals with reaching equilibrium after 30 min. However, for the two other dyes, after passing 20 min, the adsorption decreases. To have a balance for all dyes, the optimized contact time was selected at 20 min or second level. This phenomena occurs, probably due to the fact that while an equilibrium is attained, RhB can win the competition for available sites on the sand in long term. Additional file 1: Figure S4, which is shown in supplementary data, shows the effect of initial dye concentration on simultaneous adsorption of the analytes on sand. To evaluate the effect of initial dye concentration solution were made which contain concentrations between 3 and 12 mg L−1 of each dye. It was found that by increasing the initial dye concentration, the efficiency reduces because of limited active site available on the sorbent . The optimum conditions for this parameter selected 9 mg L−1 in level 3.
where VA is the variance of A. ANOVA Analysis of variance was used to evaluate the orthogonal array of design results and is presented in Additional file 1: Table S2. The last column in the Table shows the contribution of each factor to the adsorption process. In order to screen and find the best conditions for simultaneous removal of dyes, a Plackett–Burman design which is a multivariate strategy, was used. PBD is a two-level partial factorial design that can be used as an excellent screening tool to extract important information about the main factors affecting the system under study [39, 40]. Here, it was used to identify the most effective parameters involved in the simultaneous adsorption of dyes. For this purpose, 5 factors were investigated in 2 levels. Additional file 1: Table S3 shows the factors and levels at low (− 1) and high (+ 1) levels of PBD. This method was designed by Minitab 16 software. Results of experimental design for 12 experiments in 5 factors are plotted in Fig. 5, Additional file 1: Figures S5 and S6. Table 5 compares the priority of each of the factors studied in the PBD and Taguchi designs and reflects the conformance of the two methods. The adsorption rate constant of this model, K2 (g mg−1 min−1) is the pseudo-second order constant which was obtained from the intercept of the plot of t/qt against t. The slope of this plot shows qe . Additional file 1: Table S4 presents the kinetic parameters for simultaneous adsorption of MG, RhB and CR on Sistan sand, and reveals that pseudo second order is the best fitted model for kinetic of removal of them. A similar observation is reported in adsorption of reactive orange 16 . The thermodynamic parameters such as changing the enthalpy (ΔH°), entropy change (ΔS°) and Gibbs free energy (ΔG°) represent some information which confirms adsorption nature and are useful to evaluate the feasibility and the spontaneous nature of adsorption. Van’t Hoff plot (Eq. 8) was used to calculate ΔH° and ΔS° of each dye adsorbed on the sand from the slope and intercept of this plot, respectively. In order to determine the thermodynamic parameters of simultaneous removal of MG, RhB and CR, 4 experiments were carried out by OFAT method. All experimental conditions were kept constant and temperature was varied. What are tabulated in Additional file 1: Table S5 are the values of the above parameters. It is clear that positive ΔH° represents that the adsorption process is endothermic. Positive ΔS° reveals that there is an increase in randomness between the 2 phases (solid/liquid) in solution. According to the values obtained for ΔG°, the spontaneous of the simultaneous adsorption of three dyes by Sistan sand is confirmed. Total values of the thermodynamic parameters reveal that this process take place through electrostatic interactions . In order to study the efficiency of the method for simultaneous removal of MG, RhB, and CR from water samples, a 20 mL aliquot of tap water was spiked with 9 mg L−1 of each dye. Sistan sand was applied as adsorbent under optimal conditions. Spectrophotometry showed that the percentage removal of dyes for MG, RhB, and CR obtained were 92%, 76% and 83%, respectively. Also, using equation , qe for MG, RhB, and CR was calculated to be 0.133, 0.109, and 0.120 mg of dye per g of the sand, respectively. In Table 6, some other sorbents reported in the literature were compared with the Sistan sand for the adsorption of the same organic dyes. While the most of the other sorbents need pretreatments or modifications, Sistan sand which is costless and is plenty available, still has good performance for simultaneous removal of dyes. In this study, Sistan sand as a costless and accessible sorbent was used for simultaneous removal of three dyes Malachite green, Rhodamine B and Cresol red from water sample. Optimum conditions for adsorption was designed and predicted by Taguchi method and was determined experimentally. Plackett–Burman design was used to confirm the Taguchi design and as a screening method to identify the significance of each factor influencing this process. In almost all cases, a good agreement between these Taguchi and PBD was observed. Kinetic studies showed that pseudo second order is the best fitted model for all three analytes. This process is endothermic, as thermodynamic studies showed. We also demonstrated that simultaneous adsorption of environmental pollutants, especially dyes, are plainly achievable, even when the nature of target compounds are different. SM, MS and MS did the practical work. Both MK and Moj S co-wrote the manuscript and MK planned the study. MH gave his laboratory and instruments for doing experiments. All authors read and approved the final manuscript. This research was supported by The University of Sistan and Baluchestan and Zahedan University of Medical Sciences. 13065_2018_486_MOESM1_ESM.docx Additional file 1: Table S1. Factors and levels in Taguchi design to remove MG, RhB and CR. Figure S1. FT-IR of Sistan sand. Figure S2. Effect of ionic strength on removal of MG, RhB and CR based on Mean (A) and S/N (B). Figure S3. Effect of contact time on concurrent adsorption based on Mean (A) and S/N ratio (B). Figure S4. Effect of initial dye concentration on simultaneous adsorption based on Mean (A) and S/N ratio (B). Table S2. ANOVA results for simultaneous removal of MG, RhB and CR. Table S3. Factors and levels were used for concurrent adsorption of MG, RhB and CR in PBD. Figure S5. Main effects plot for RhB removal by PBD. Figure S6. Main effects plot for CR removal by PBD. Table S4. Kinetic parameters of simultaneous removal of MG, RhB and CR by Sistan sand. Table S5. Thermodynamic parameters on simultaneous removal of MG, RhB and CR.